To wear Aso Ebi or to NOT wear Aso Ebi is the Question ? Now that summer is here and wedding season is well underway, I thought it would be very appropriate to touch on this subject. And seeing that I have a PHD (Prestigious, High Quality, Dresser) in wearing Aso Ebi to events according to my friends lol, I thought I’d be the perfect person to discuss it. 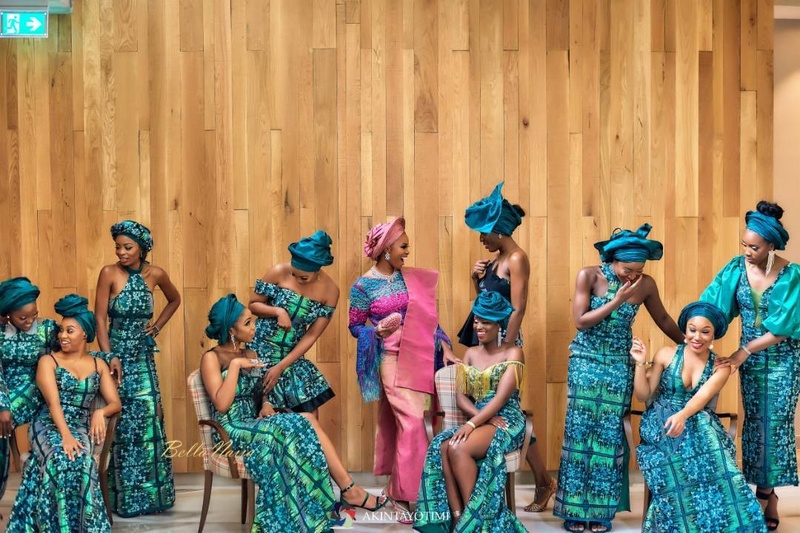 Before we move forward, let me break down the exact definition and origin of Aso Ebi for those who may be new to this concept. Aso ebi or Asoebi which is Pronounced “ASHO EYBEE” can be defined as Nigerian/African outfits made from matching fabric to be worn by a group of people to a party or wedding as a uniform. It is a uniform dress that is traditionally worn in Nigeria and some West African cultures as an indicator of cooperation and solidarity during ceremonies and festive periods. The purpose of wearing the dress can be to serve as self-identification with age mates, relatives or friends during social occasions or funerals. The word “aso” in Yoruba means cloth and “ebi” denotes family, so Aso ebi can be described as a family cloth usually worn during funerals or family ceremonies. However, the practice is now beyond family dressing because strangers of a celebrant can wear the Aso ebi. Wearing a certain Aso Ebi identifies the group of wearers. For instance, at a wedding, all the bride’s friends might wear blue and gold, the bride’s family might wear white and gold, and the groom’s friends might wear black and pink, and so on. 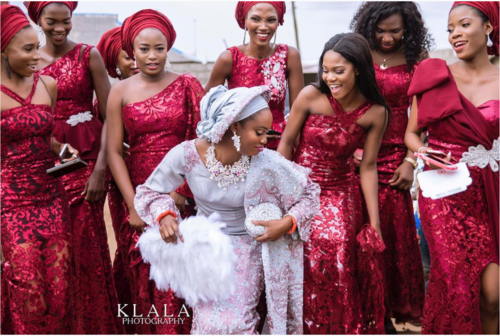 Usually at weddings, the various fabrics for the aso ebi are decided by the bride, and are then announced to the selected guests months in advance so they can prepare their outfits. 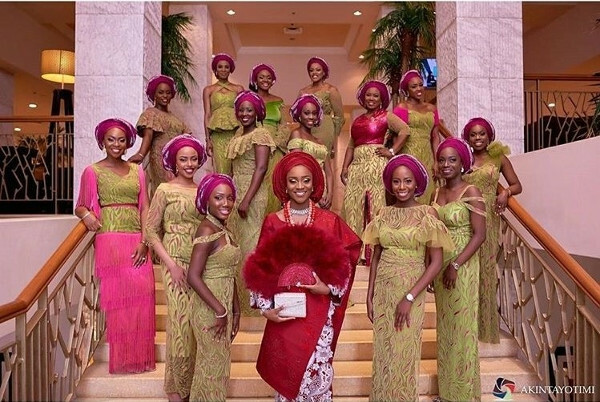 Basically the Aso ebi is an optional extension of the bridal party. Your outfit can be sewn in any style you like. In fact the more creative, the better! It just has to incorporate that material. Alright! Now that we all have a better understanding of this concept..To wear Aso Ebi or to NOT wear Aso Ebi is the Question ? 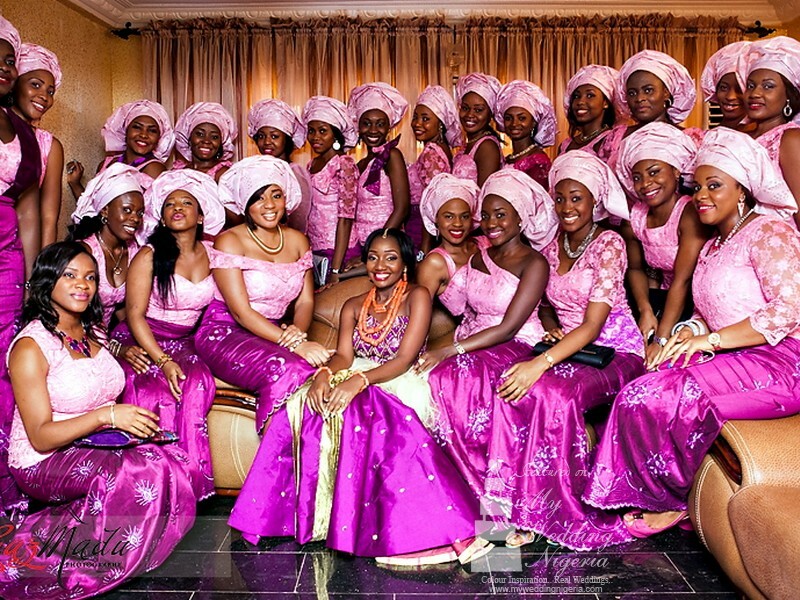 Weddings in the African/Nigerian culture get bigger and bigger over the years. We love to be over the top in how we celebrate and what we wear. So our clothing is very important. Now don’t get me wrong, I love partaking in a close friends event and buying the Aso Ebi, but sometimes I have to ask myself, is the headache and money truly worth it? After you pay for the material, find a seamstress to sew the outfit and pay her, you are running close to $200+ not including wanting to probably get your makeup and nails done for this big event. We also know some people who sell their material WAY MORE than the original price most likely to help with funding for the wedding, but should it really be treated as a fundraiser? Isn’t your friends supporting you enough as it is? Because let’s be honest, after you wear it once, it just collects dust in the back of your closet. There are a lot of people for and yet also against wearing Aso Ebi. I have decided for myself, that I can only wear it for very close friends and family, because the money I have spent over the years is quite ridiculous. One can not come and kill themselves in the name of Aso Ebi lol…but seriously at the end of the day do what makes you happy and what you can afford. Where do I go to get the outfit sewn? Typically the material is taken to a seamstress/tailor where you give them your design and they bring it to life. Ask around to find a list of options for tailors and seamstresses in your area. Most of them will work with you and help you come up with a look that works with your body type and the material. How long does the sewing take? Allot at least 6-8 weeks minimum for the outfit. The earlier, the better, tailors/seamstress book up quick. How do I pick a style for my outfit? 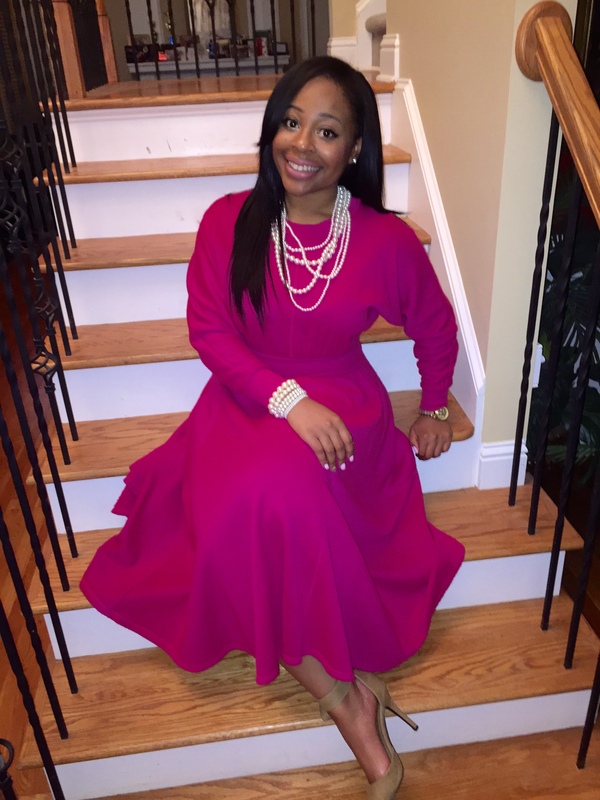 Asoebibella as a few sites to see designs and get some inspiration. Is there a dress you saw at the oscars and always wanted…use that design! Are there any restrictions on my style/design? There are No restrictions! Unless the bride or whoever gives you the material has certain requirements. But now is the time for you to shine and make and outfit that fits you. Go all out, but don’t outdo the celebrant! I’m convinced Africans don’t know how to be guests, they want all eyes on them as soon as they walk through the door. Nothing is wrong with that, but just try to not be too over the top especially for a wedding. Do set a limit. Know how many Aso -Ebis you can afford to buy this year and please do attach a cost.When you reach that threshold, just respectfully decline when someone asks you to buy Aso-Ebi. Do pick the weddings you will attend. You really do not have to attend all the weddings you know. The more weddings you attend, the more you will need to spend to ensure that you get your slay on. You can choose to attend only the weddings of close family, friends and associates only. Don’t feel obliged to buy Aso-Ebi. You should never feel pressured to get Aso-Ebi. Be let by financial wisdom before you make any purchasing decision. What’s the point of soaking Garri after buying a ridiculously expensive Aso-Ebi simply because you want to please your friend? Don’t feel left out. Be prepared to get to the wedding to see people in Aso-Ebi. The good news is that there will be others who won’t be wearing Aso-Ebi as well. So, you are in good company. 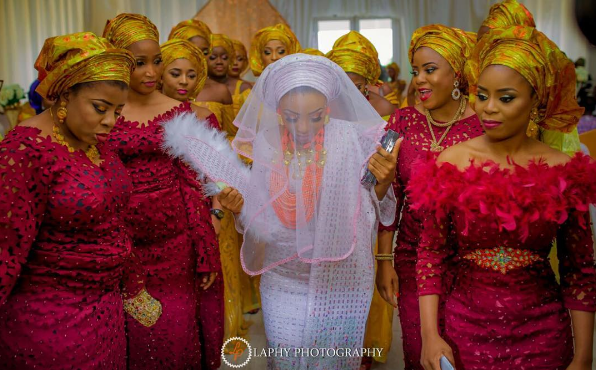 Hopefully this gave you a bit more insight on the world of Aso Ebi!